The Pianoroll, Score and Drum editors not only can select a part of a track (like an audio editor), they can select or add notes as well. You can use this to correct the odd mistake, but you can also use it to build tracks from scratch. Select Part: works just like an audio editor, ie. the mouse doesn't "see" the notes at all. Select Notes: clicking a note selects it, pressing the mouse in "empty space" and moving it lassoes notes. Selected notes can be moved. Add Notes: clicking in "empty space" adds a note, clicking a note selects it. Moving the selected note(s) is possible as well. The buttons in the bottom left corner can be used to switch mode. The Alt key (Windows) / Option key (Mac) can be used to temporarily switch between Select Notes and Add Notes mode: in Select Notes mode you can add a note using this key, in Add Notes mode you can lasso notes using this key. In Add Notes mode notes can be added by clicking the mouse. In Select Notes or Add Notes mode a note can be selected by clicking it. Multiple notes can be selected by keeping the Ctrl key (Windows) / Command key (Mac) down while clicking a note. 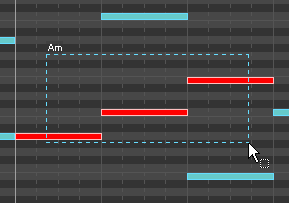 In Select Notes mode you can also lasso a rectangular region. Selected notes appear in red. Notes can be moved using the mouse. The editor will scroll automatically if the mouse approaches any of the four sides of the editors. Notes that are being added, dragged or selected are audible. This feature can be turned on/off in the Preferences window. 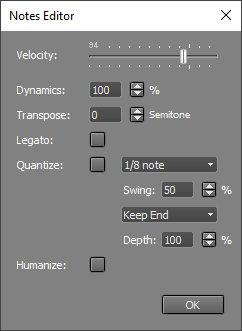 The Note Editor (see below) can be used to change a note's velocity (volume). It can be done faster using the 'V' mouse modifier key (see Mouse Modifiers): press the left mouse button while keeping the 'V' key down. A vertical slider pops up which can be controlled by moving the mouse. The slider disappears upon releasing the mouse button. 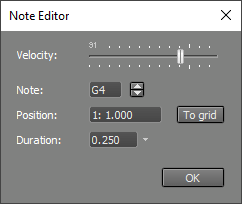 If a single note is selected clicking the Edit button will pop up the Note Editor. Alternatively you can double-click the note. If the Time Scale is set to bars the Position of the note is expressed in bars and beats, and the Duration of the note is expressed in musical notes (ie. 0.25 is a quarter note). Values like '1/4' can be typed in the Duration box as well. The down array next to the Duration box can be used to select a value from a predefined list. The Edit button pops up a slightly different window if multiple notes are selected. Rightclicking (Windows) / Ctrl-clicking (Mac) a note pops up a menu offering Edit and Delete functionality. Doing the same in 'empty space' pops up a menu to add notes or chords.